It’s the end of half-term and I haven’t really had a break. Jonathan and I spent the first three days of this week in Cambridge, working on a set of films for the lovely people at SAPS. I’ve spent the rest of the week doing some much needed re-decorating of my bedroom and, of course, marking stuff ready for the return to school. The picture above is of garlic, which I peeled and chopped (in a blender thingy) earlier today, before freezing in an ice cube tray. It took me about 30 minutes to do this (while faffing about on Twitter and listening to music) and I’m glad I had the time to do it because that garlic is going to make my life just that little bit easier over the next couple of weeks. I love cooking and I use a lot of garlic when I do – everything from a whole bulb in my dal to a few cloves fried with chilli in oil to make the simplest but most delicious of pasta sauces. But I hate peeling and chopping garlic and having it pre-peeled and chopped in this way removes the one part of many recipes I don’t like doing. (I know you can buy it like this in jars but, I swear, none of the stuff from the shops is as good as this, nor as cheap). This little act of preparation, of being organised and ready for cooking in the future, really does make a huge difference to my enjoyment of cooking. I think it’s the same with teaching – I always enjoy it more when I am prepared and organised to teach. 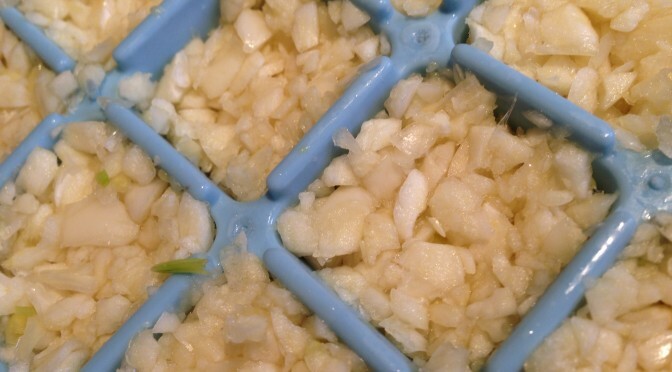 …but what is the teaching equivalent of freezing your garlic? Preparing PowerPoint Slides? Reading what the textbook says? This evening: writing a brief test on waves for Year 10 so that it’s ready to photocopy when I get into school tomorrow. Photocopying tests and worksheets is probably the closest thing to freezing garlic in practical terms, but having the time to think through a really plan a lesson would be better.